World War II ended in 1945, but victory soon turned to an uneasy peace, as long running tensions between once Allied nations surfaced in what became known as the Cold War. The tensions between the communist Soviet Union and the democratic United States are referred to as a Cold War, since animosity between the two took shape in the form of proxy wars and political maneuvering, rather than prolonged violent fighting between the two countries. Within the United States, fear of communist infiltrators reached a fevered pitch, known as the Red Scare. 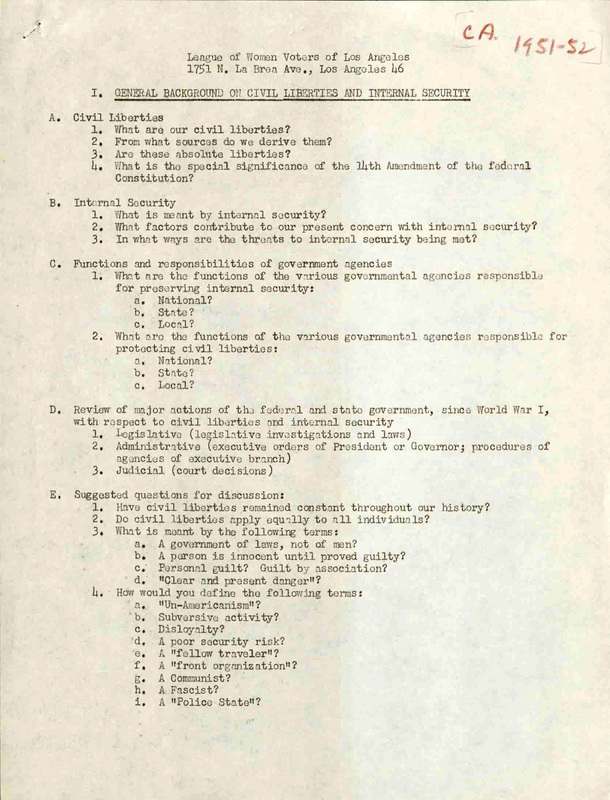 American politicians stoked fears of communist espionage, with Senator Joseph McCarthy attempting to root out communist infiltration through a series of accusations of subversion or treason. His accusations led to the coining of the term "McCarthyism" to describe the practice of making accusations without assessing evidence. 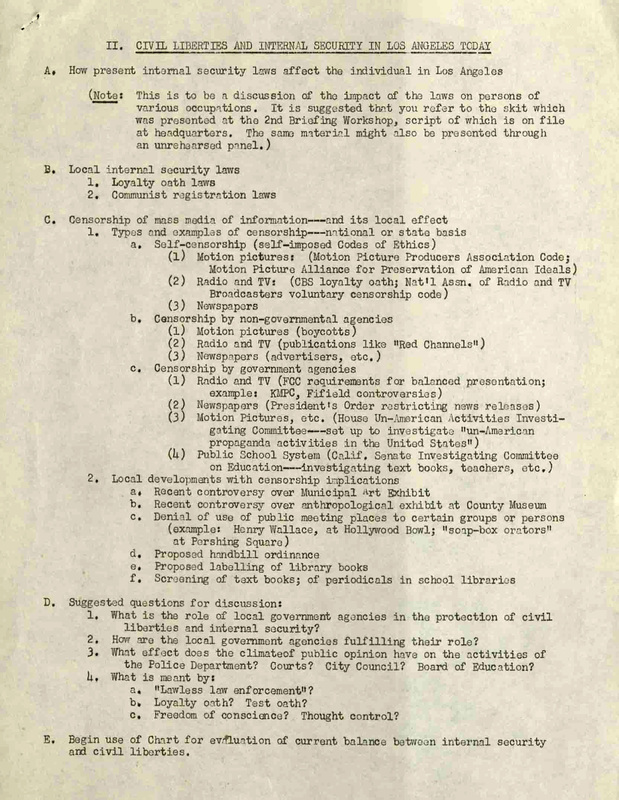 In a political climate of deep paranoia and a desire to preserve American values, President Harry S. Truman's 1947 Executive Order 9835 required loyalty oaths and background investigations on persons deemed suspect of holding party membership in organizations that advocated violent and anti-democratic programs. Additionally, in California the Levering Act required state employees to sign loyalty oaths stating that they disavowed radical beliefs. 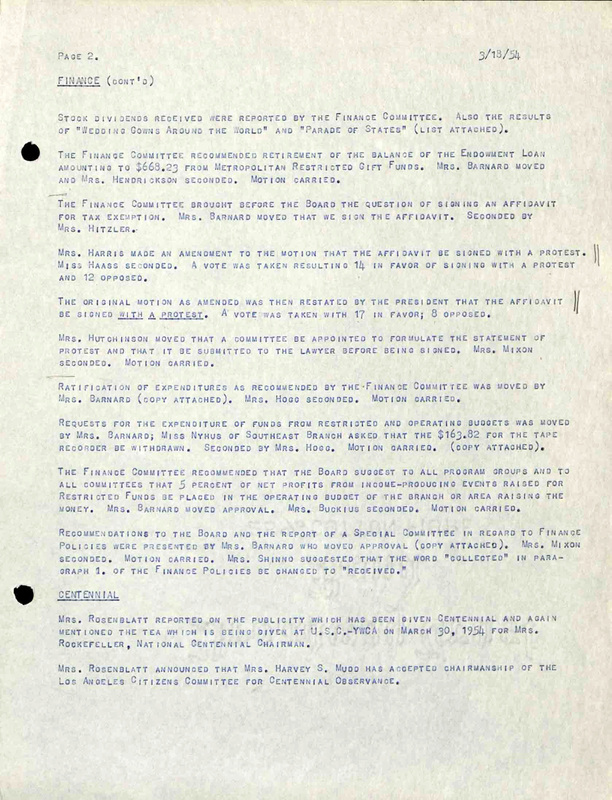 In Los Angeles, the Young Women's Christian Association (YWCA) was required to sign a statement of loyalty and send it in to the Los Angeles County Assessor as part of remaining tax exempt. 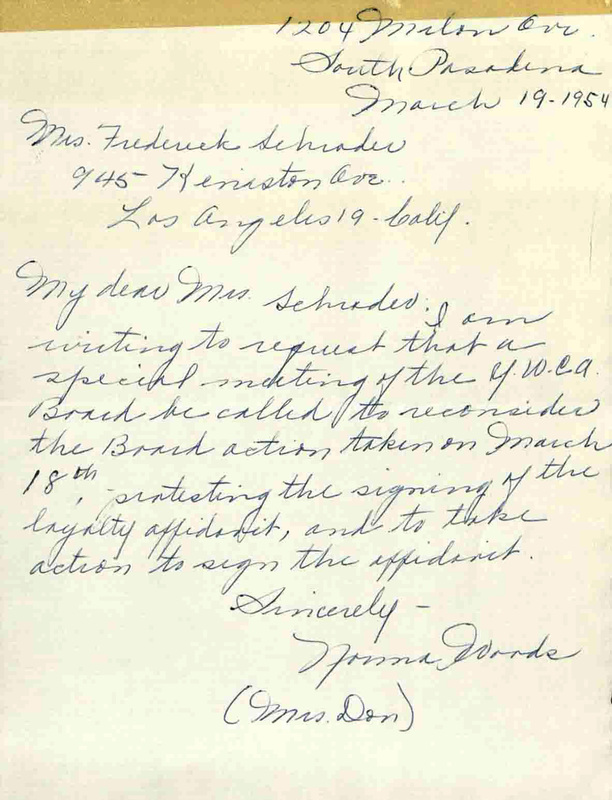 The Board of Directors for the Los Angeles YWCA voted to sign the loyalty oath, but not without also sending along a letter of complaint. 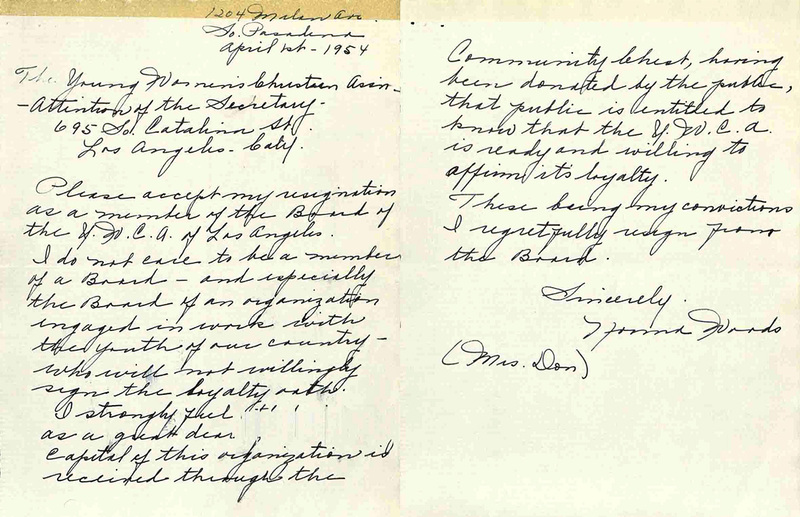 In their letter they noted that "Such an Oath conflicts with our Christian convictions by discrediting full faith in the integrity of our finest and most idealistic institutions and by making the futile attempt to test loyalty by words instead of deeds." 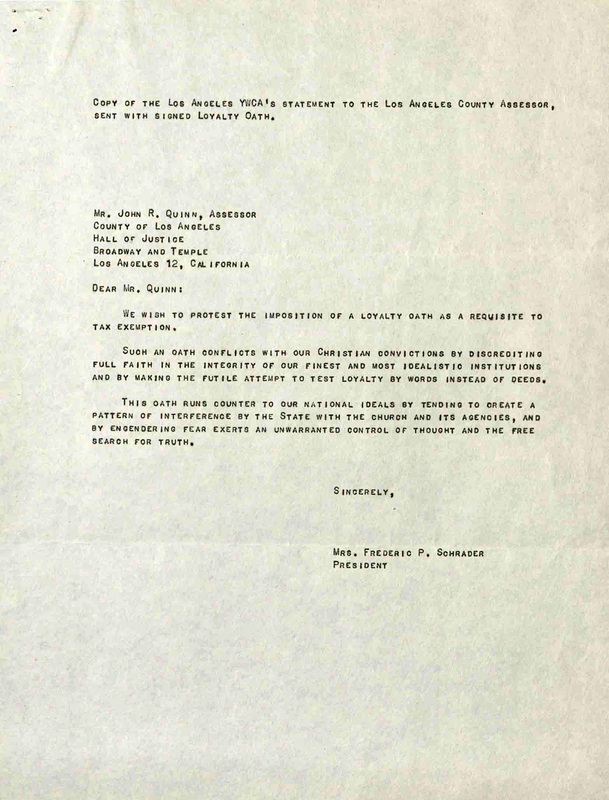 This letter and the meeting notes documenting the debate are in the Young Women's Christian Association (YWCA) of Los Angeles Collection. 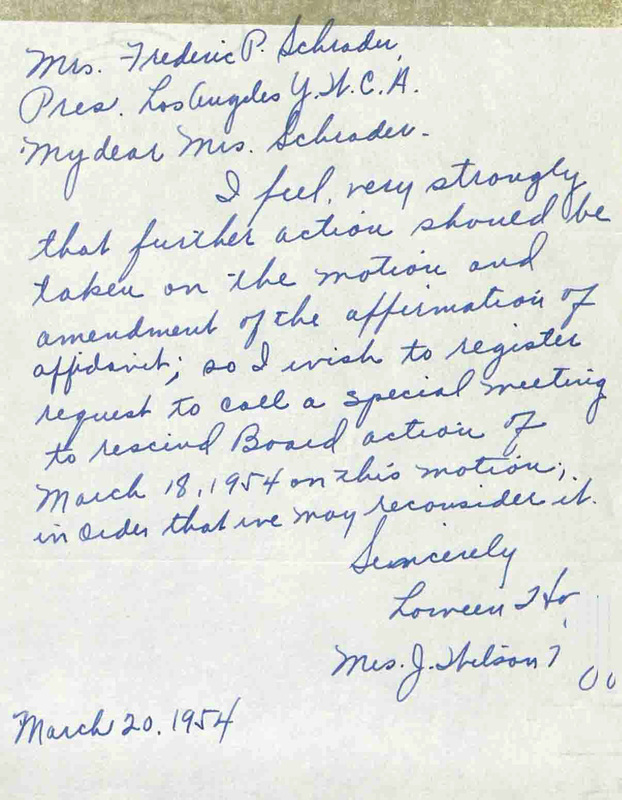 The Board voted on the decision to send the letter, and the choice to send the protest statement won by a close margin. Some Board members resigned in protest, but the decision to sign the oath along with a complaint statement remained the official stance of the Los Angeles YWCA. 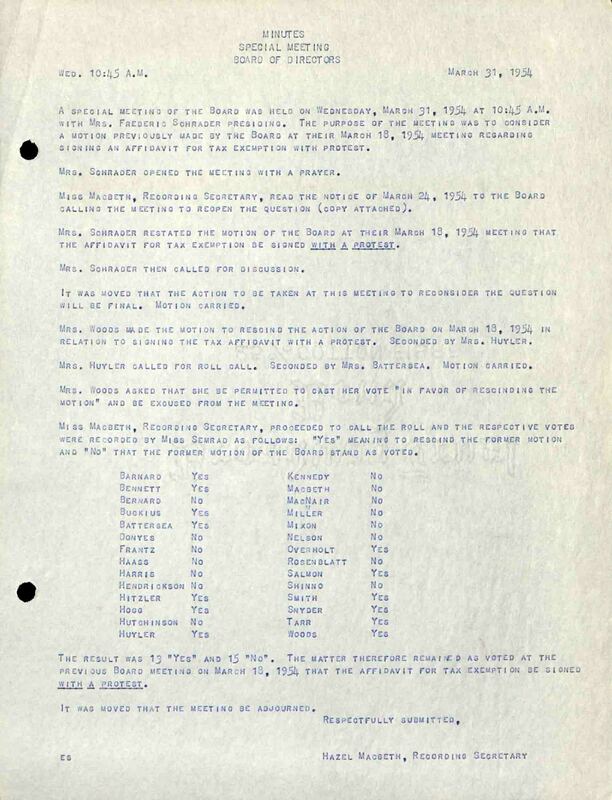 As they stated in their letter, "The Young Women's Christian Association, with an unblemished record of loyalty to American democracy, believe that its entire action is an expression of the American Way. We believe with other Americans that loyal dissent is an expression of the democratic process." 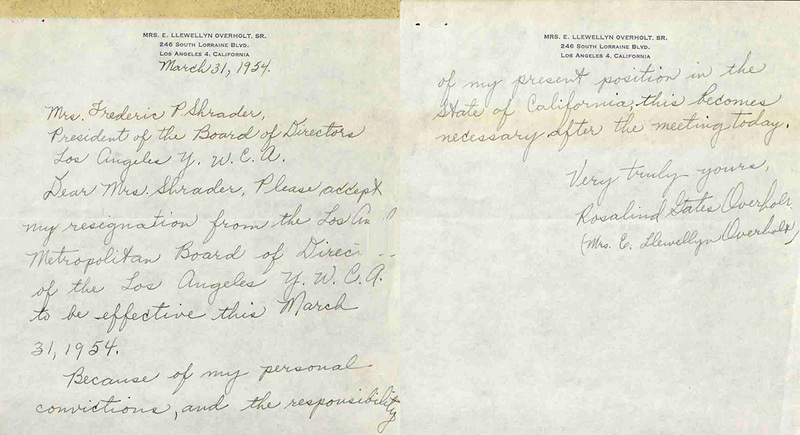 The League of Women Voters of Los Angeles took an analytical look at this rise of loyalty oath requirements. The League of Women Voters is a non-partisan organization with the primary purpose to promote political responsibility through informed and active citizen participation in government. As part of this mission, the League holds discussions and publishes informative materials for voters that aim to be as unbiased as possible. 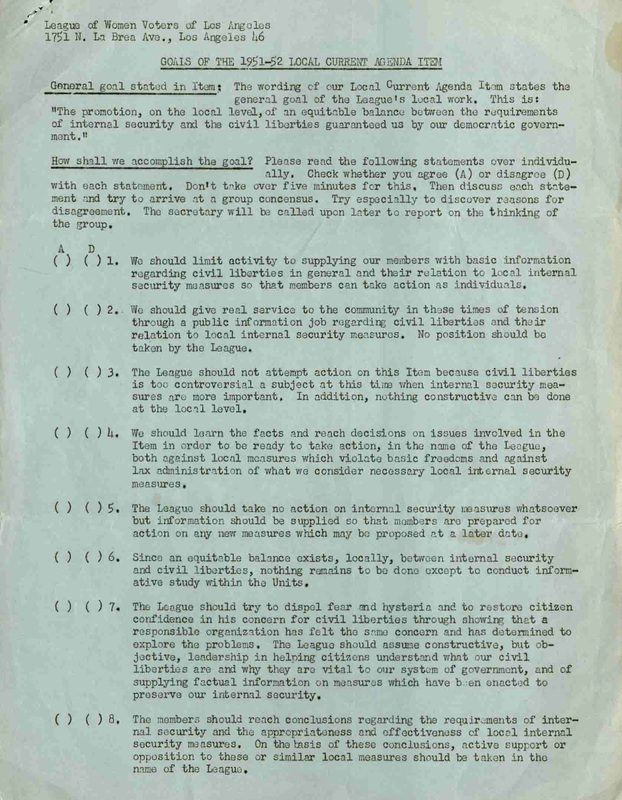 One of the local focus issues for the League in the early 1950s was the tension between civil liberties and internal security. 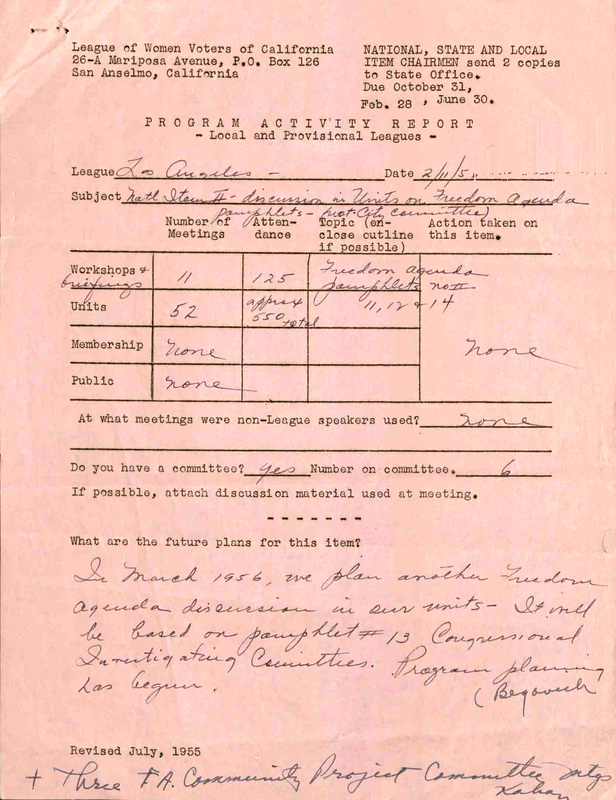 Notes and documents in the League of Women Voters of Los Angeles Collection chronicle the programs and discussions centered on this focus issue. The League of Women Voters of Los Angeles held workshop discussions they called "Buzz Clusters," created statements to encourage debate, and compiled information on relevant local legislative, administrative, and judicial milestones. 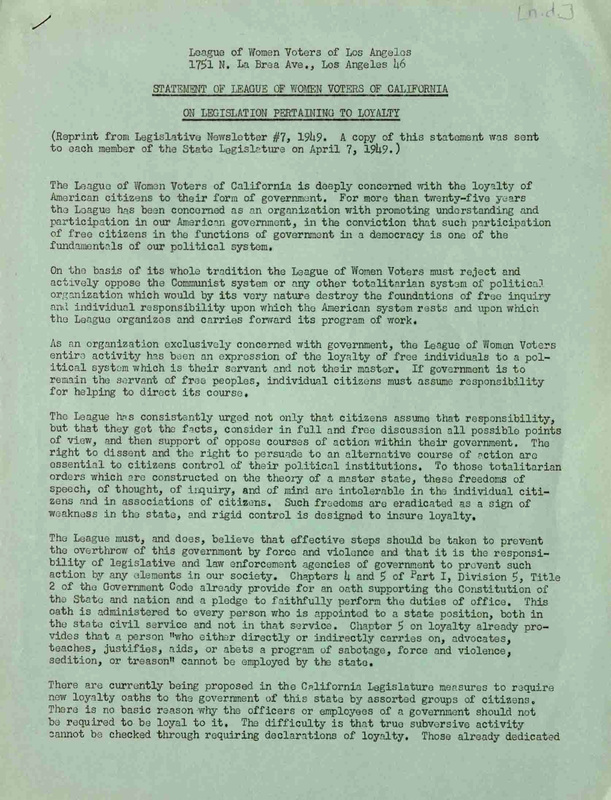 The League's goal was to promote a local "equitable balance between the requirements of internal security and the civil liberties guaranteed us by our democratic government."